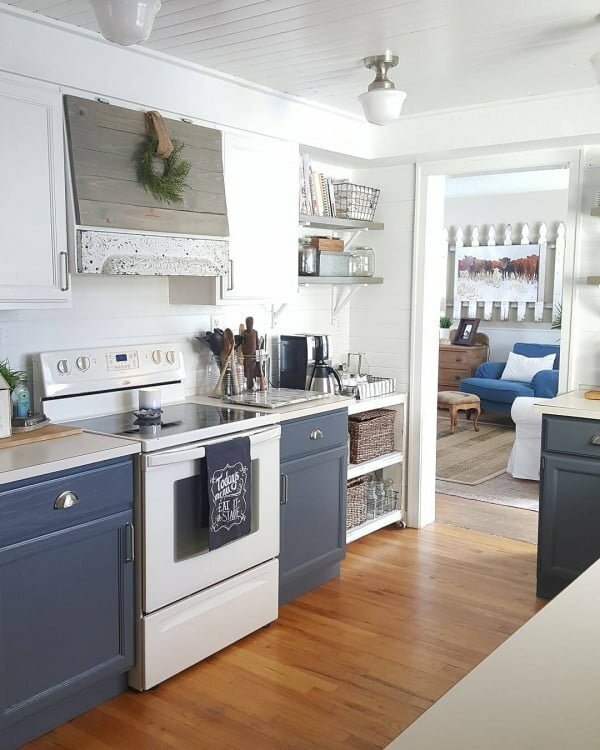 Looking for blue kitchen cabinets for a makeover? Check out these kitchen cabinet ideas for the inspiration of your new decor. When it comes to kitchen cabinetry, it does not have to be white. 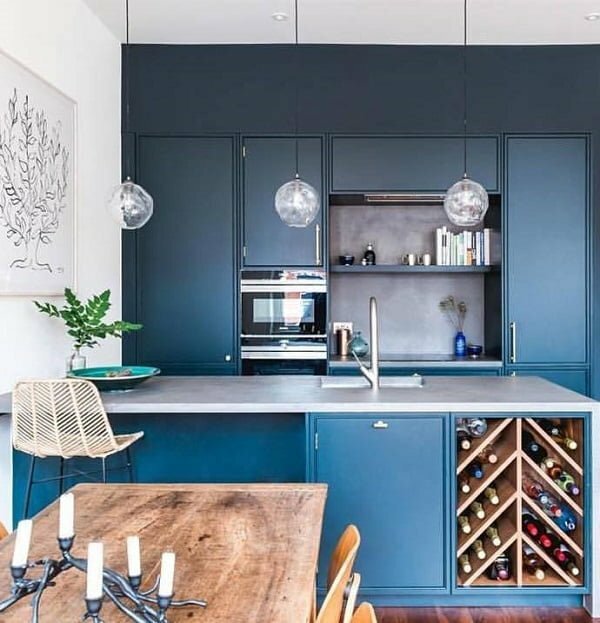 In fact, blue kitchen cabinets are as unique as they are functional. 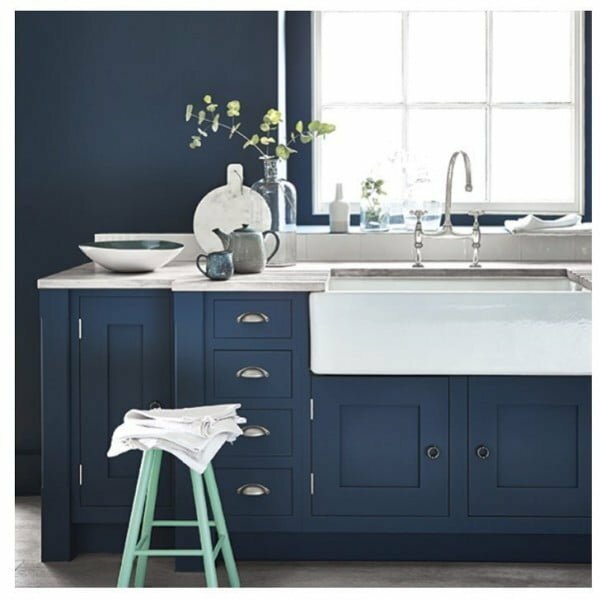 From Hague Blue to Palladian Blue, there are several tones available to enhance your kitchen decor and style. With the right lighting accents and appliances, you can create a modern kitchen with true elegance and sophistication. 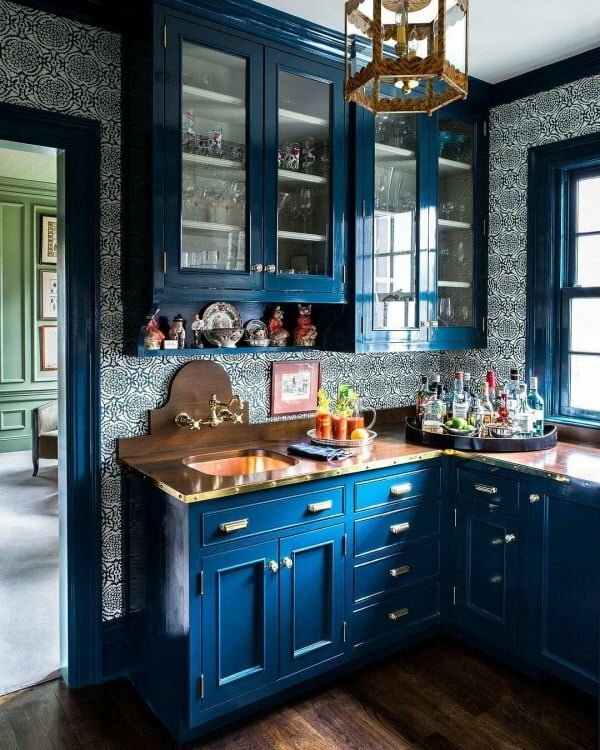 Blue kitchen cabinets continue to soar in global popularity. They are also the perfect way to add different styles with a touch of class during your next makeover (consider DIY kitchen cabinets?). Here are 30 great ideas for those that love to think and design out of the box! 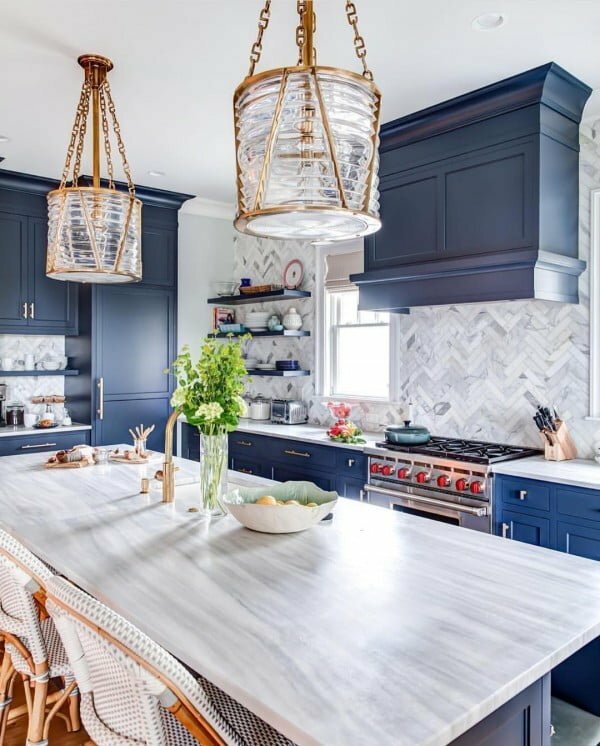 This project features blue kitchen cabinets accentuated with brass hanging lights. The navy, gold, and marble also add the perfect contrast to the deep navy blue colors. This kitchen design shows true innovation at its finest with uniformity and consistency in design. Simple styling and soft blue colors were used for this streamlined kitchen. With centralized designs and ornate coving, you genuinely get a feeling of deep tranquility with this calm family kitchen. A lighter shade of blue kitchen cabinets was used in this South Wing Kitchen. With simple designs and soft Trinity Blue colors, the kitchen truly captures the allure and essence of contemporary decor. The ample natural light and high ceilings also add to the overall style and theme of openness and freedom. The solid slate blue cabinets contrast well with the brown counter-tops and metallic-grey appliances. A contemporary setting that works great even in traditional kitchens. The beige flooring and wall sections also enhance the overall look of the kitchen design. 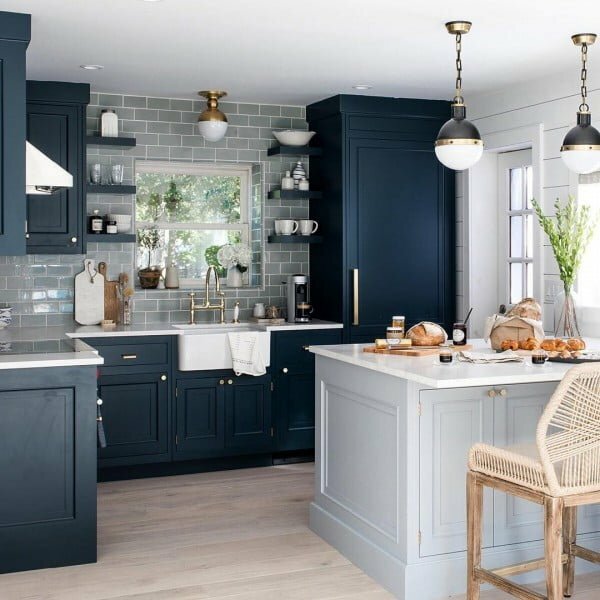 The Dark Blue kitchen cabinets are genuinely vibrant and elegant. 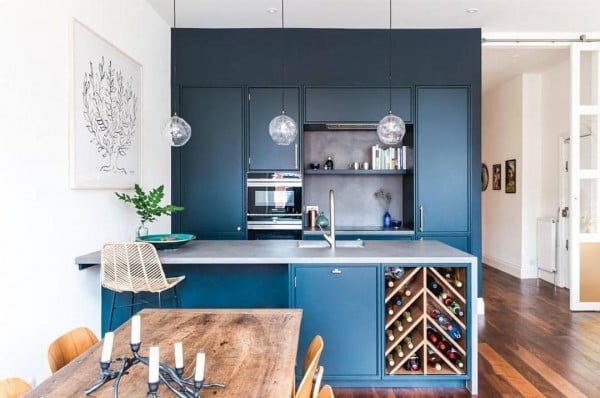 With geometric designs and a built-in wine rack, this project is inspiring and artistic at every turn. Perfect for those that love futuristic styles with practical and convenient amenities. There is something unique about adding mixed metals to your kitchen design. 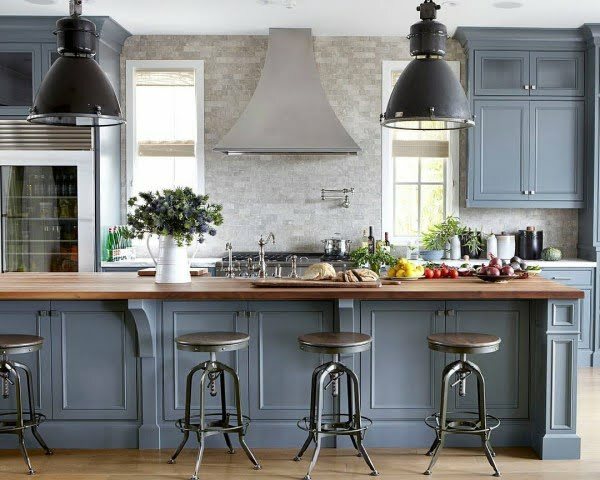 This kitchen incorporates various hues of blue to accentuate the brass bar stools and hanging lights. Another fantastic example of exquisite interiors that can turn your kitchens into works of art! This Scottish-inspired kitchen makes great use of blue and white colors. With high ceilings and cabinetry, the gold handles add the perfect accents to this contemporary kitchen. The white tiling and beige flooring also create the ideal ambiance and contrast. This kitchen remodel in Boulder combines elements of Western design with modern accents. 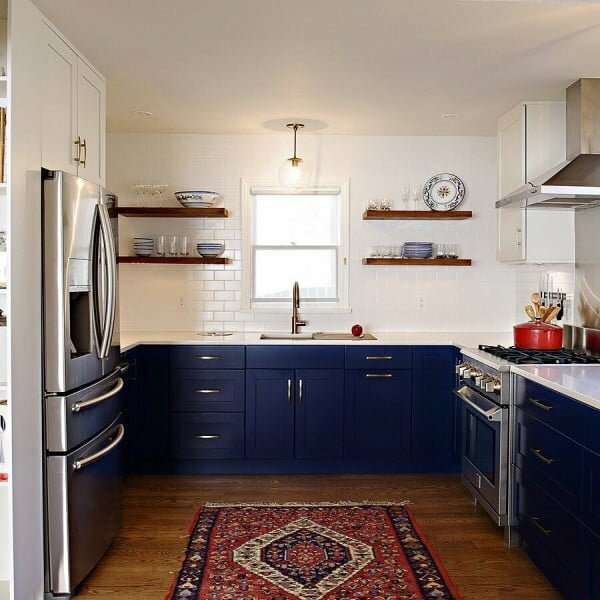 The blue kitchen cabinets are enhanced by brass hardware — along with a vintage rug and great lighting. This project shows that with a little innovation, you can create a kitchen with old and new styles that work well. 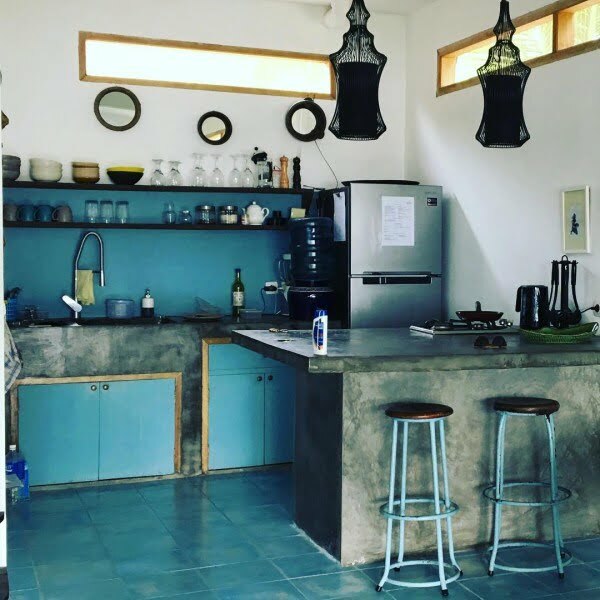 This interesting rustic kitchen project utilizes metallic blue for its appliances. 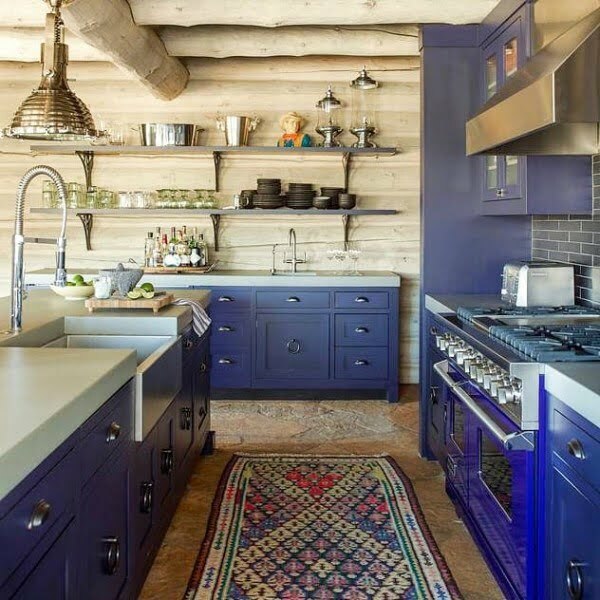 However, the kitchen also makes use of purplish-blue tones for its rustic kitchen cabinets. This contrasts well with the lighter blue slate countertops and almost liquid-blue stove range. With brass elements and a psychedelic-colored rug, this fun-filled project is excellent for open-minded kitchen lovers. The coastal blue colors are everywhere in this enchanted Beachfront Villa kitchen. 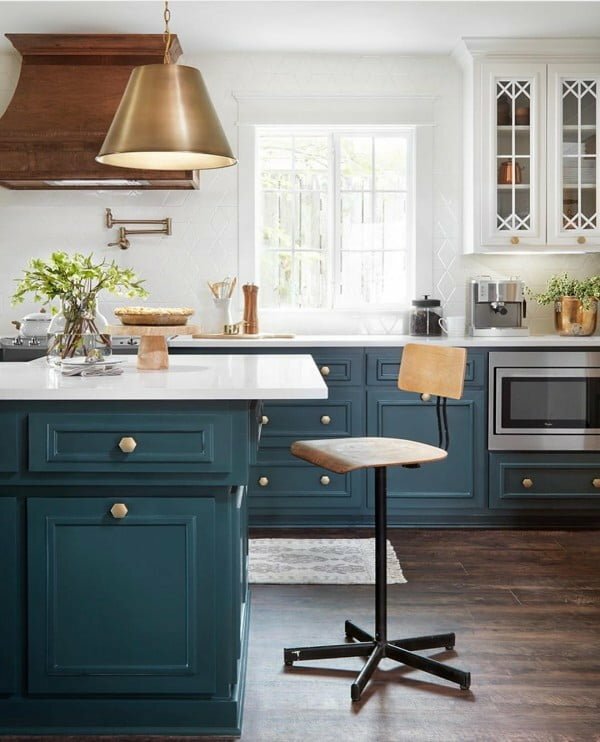 With aesthetically-pleasing designs and a slate of black, aqua and beige colors — this fabulous kitchen makes excellent use of open space and nautical-aquatic themes. 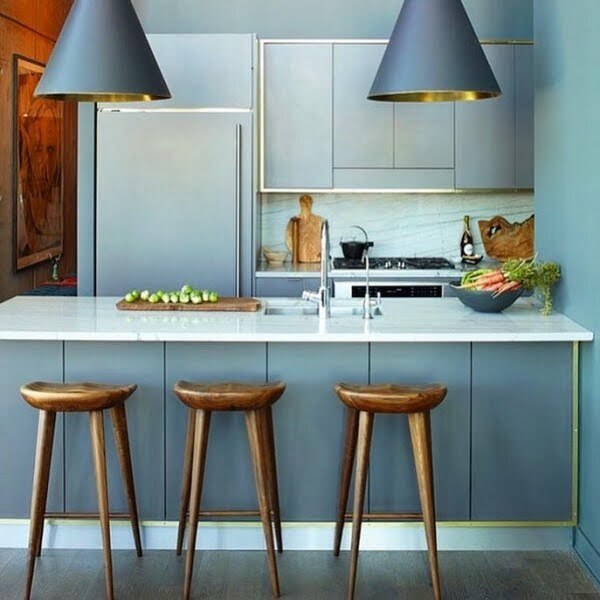 This NYC kitchen project is courtesy of Bob Miller and Michael Maher Design. With vibrant blue kitchen cabinets fitted with white shelving and glass, you have another exquisitely designed kitchen with big-city amenities. The wooden counter-tops and intricate wallpaper perfectly add to this unique kitchen space. 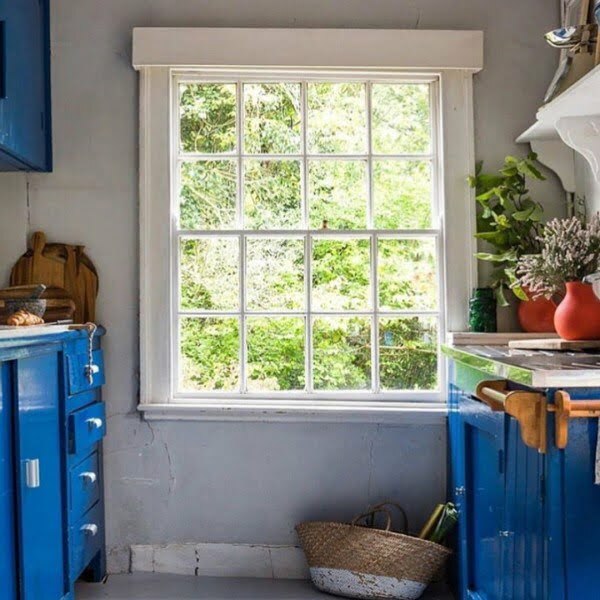 This throwback to the 1960s features hand painted blue kitchen cabinets. Not much in a design sense — but still a cozy kitchen with ample sunlight, flora and off-white walls. This dazzling kitchen project features rich cabinet colors paired with Cambria. The stunning blues work well with the Torquay Matte design and white-grey brick wall. 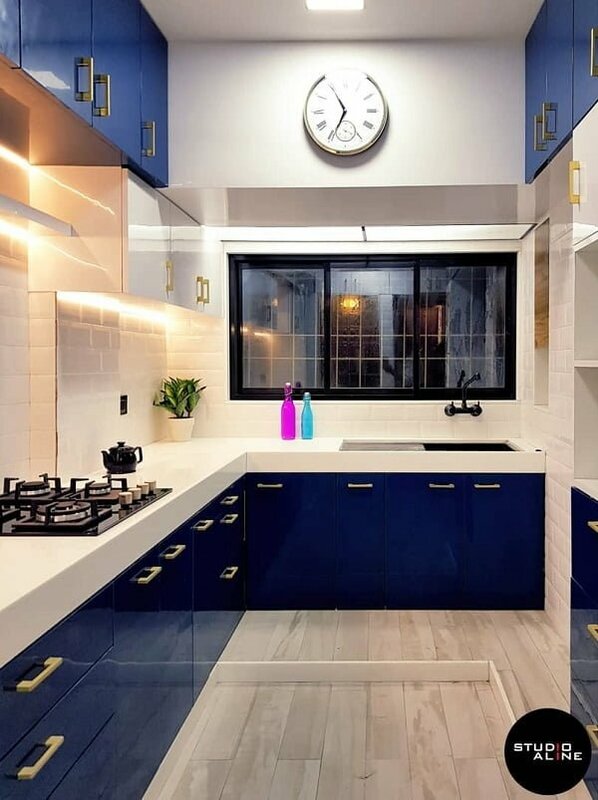 Another unique design kitchen with a fresh perspective on blue cabinetry and white offsets for superb contrast. The combination of neutral blue and grey colors are subtle but inspirational. A very economical kitchen – that makes excellent use of traditional brown wood flooring – to accentuate the overall theme. 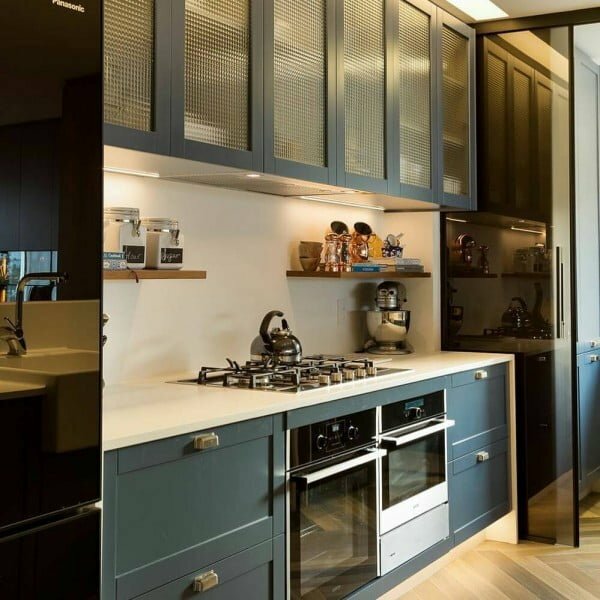 This geometrically designed kitchen uses powder blue colors to enhance the black-grey appliances. 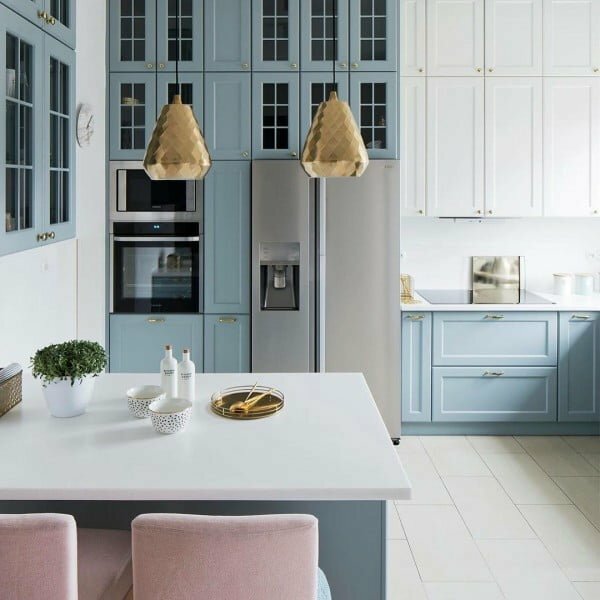 Similarly, the cool blues work well with the cabinetry, while the brass lights and white-grey table — with powder pink chairs — add true serenity and calmness. 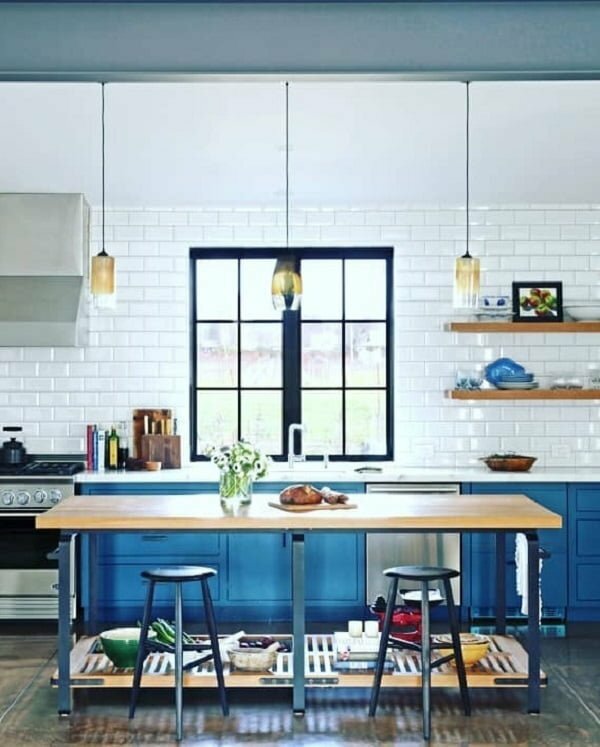 Create a beautiful kitchen by adding blue kitchen cabinets in certain sections. In this project, the cabinetry is near the window with sufficient natural light. It looks like an open armoire with display cases for fine China and crockery. 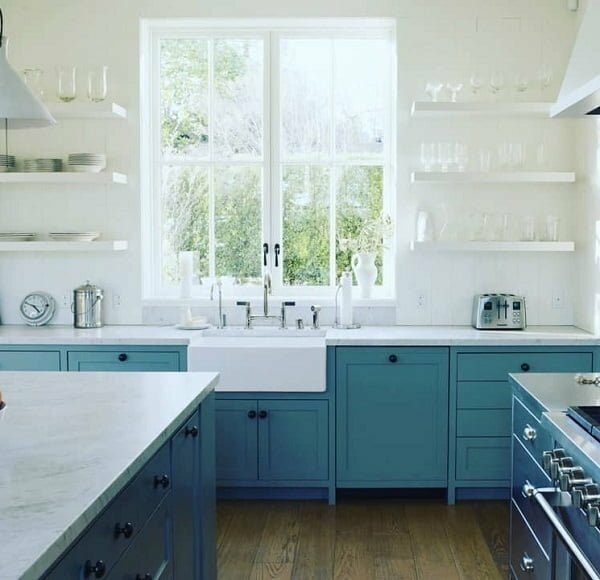 Add an innovative touch to your kitchens with wall-to-wall blue cabinetry. 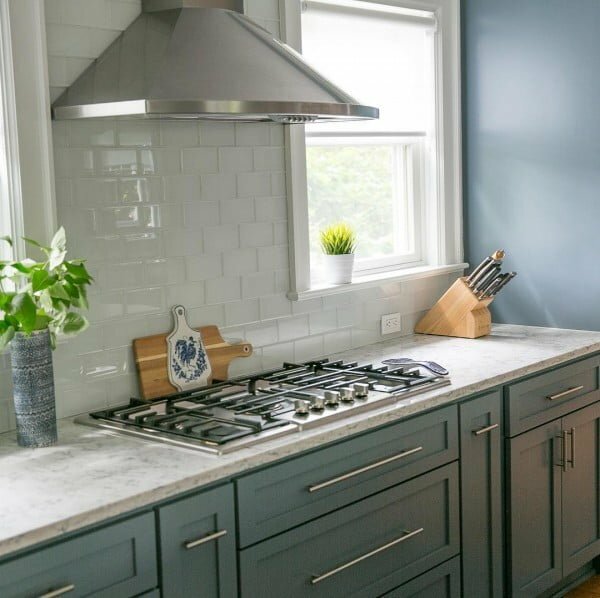 This project has blue cabinets at every turn — with glossy countertops that contrast beautifully with the light blue, slate blue and grey walls. Blue and gold are very compatible and work great in any room. This project features teal-blue cabinets with gold knobs and brass hanging lights. There is also a brownish-beige high chair, and these colors allow you to express your creativity with all types of flora and decorative elements. 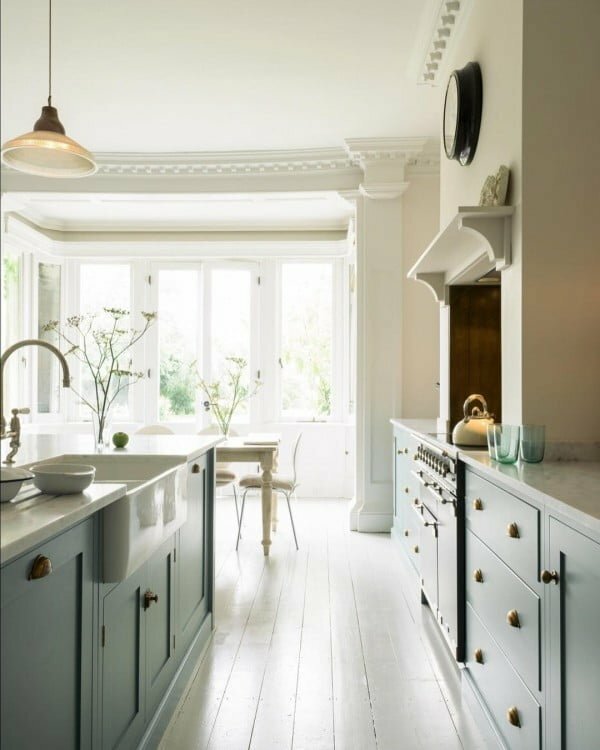 Add a touch of class with blue kitchen cabinets in any style kitchen. This remodel uses a Dark Navy Blue color to contrast with the white countertops and beige-black chairs. The dark cherry wood flooring also accentuates the overall style and design. This Tiki Island kitchen project is courtesy of Brookhaven Cabinetry. 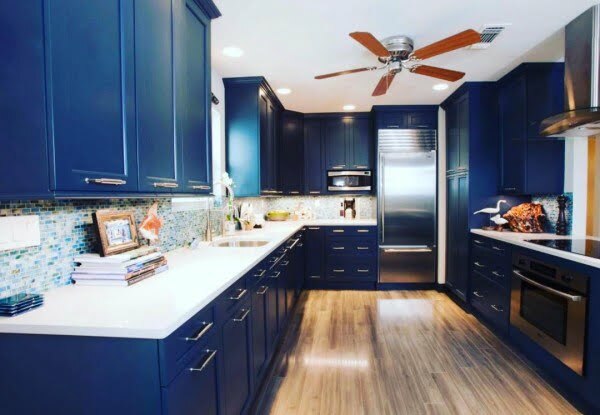 A beautifully designed kitchen with blue cabinets, metallic handles, bronze trim appliances, and wood flooring. 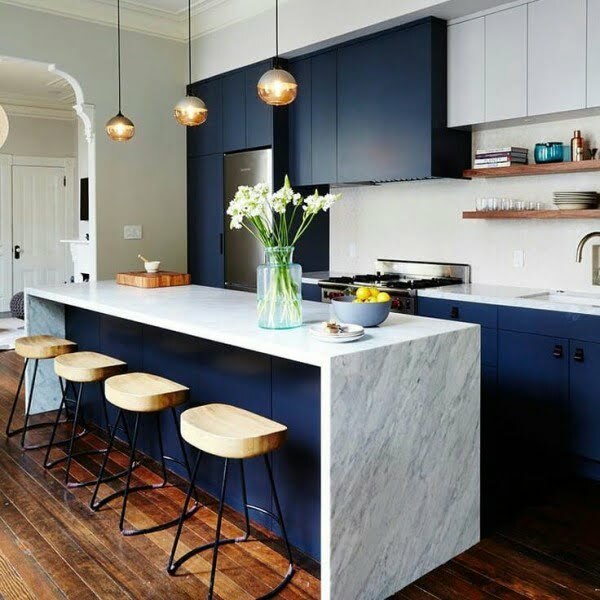 Dark blue cabinetry works incredibly well with marble countertops and stone ranges. Add some stand-alone wood shelving, and you got the perfect modern — and functional — the kitchen. This project is another excellent example of many blues in action. 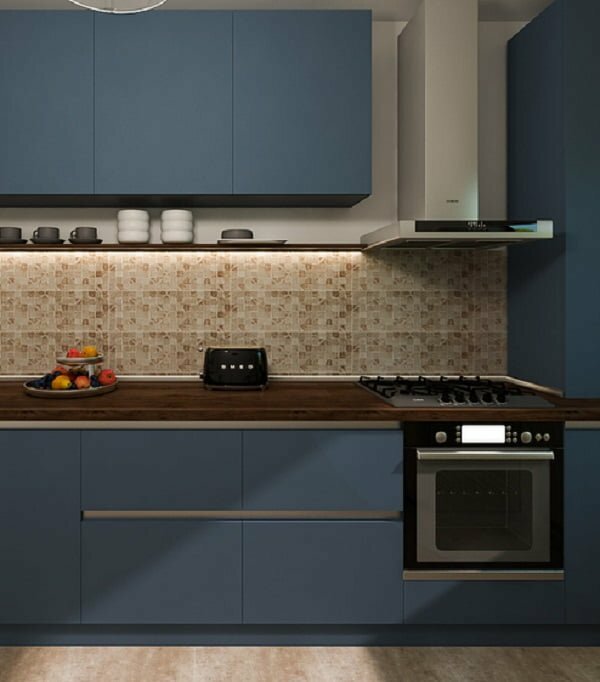 We have aqua blue for the lower cabinets, while dark blue is the preferred colors for appliance trims and the stove-top range. 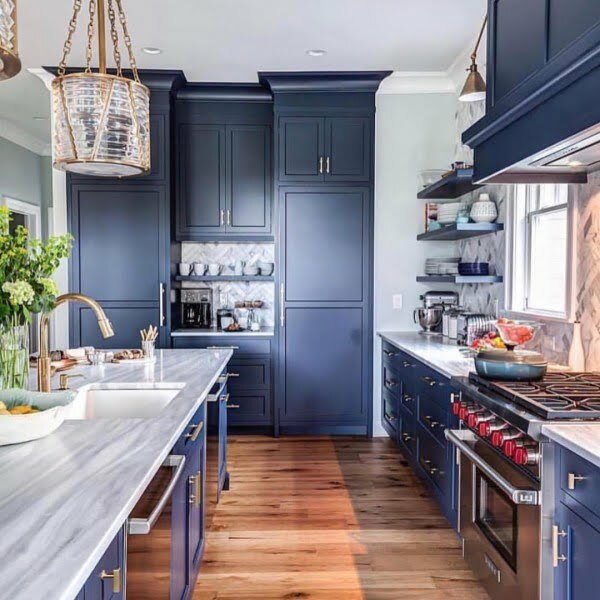 Navy Blue seems to be the preferred color of choice for many kitchen remodels. However, you can also add glass or white counter-top overlays for more unique design experience. This project uses that concept with the sink area — and it looks fabulous! Subway tile walls have seen a strong resurgence in popularity over the last few years. Add some blue kitchen cabinets, and you have a spectacular room with captivating and compelling designs. If you have a white cutting slab, nothing works better than blue slate cabinets and walls. These cool colors add casual elegance and tranquility across your kitchen. 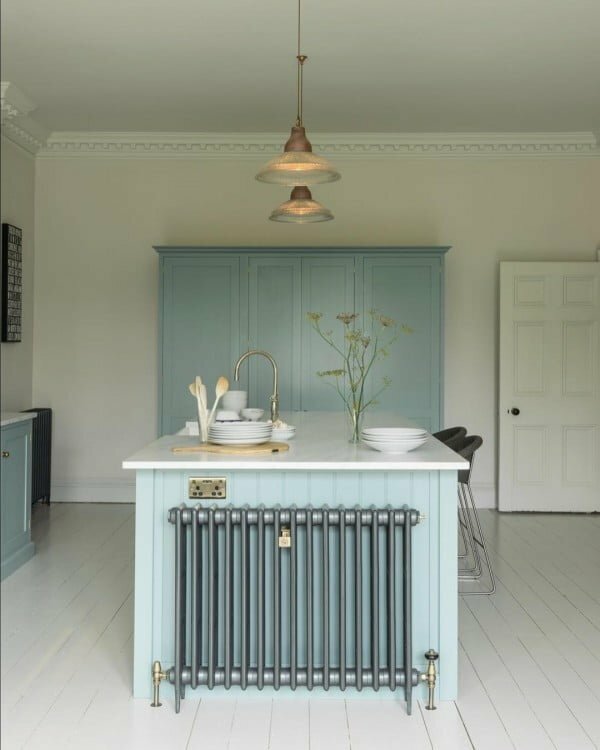 This project is another excellent example of blue cabinets working well in metallic kitchens. The cabinets seamlessly blend in with the chairs, lamps, and white-frame windows. Another masterpiece! Another marriage of colors made in heaven. 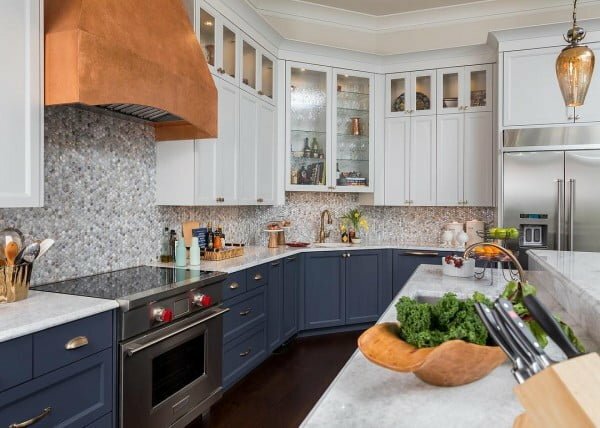 This fantastic project showcases blue kitchen cabinets with copper-orange appliances and accessories. 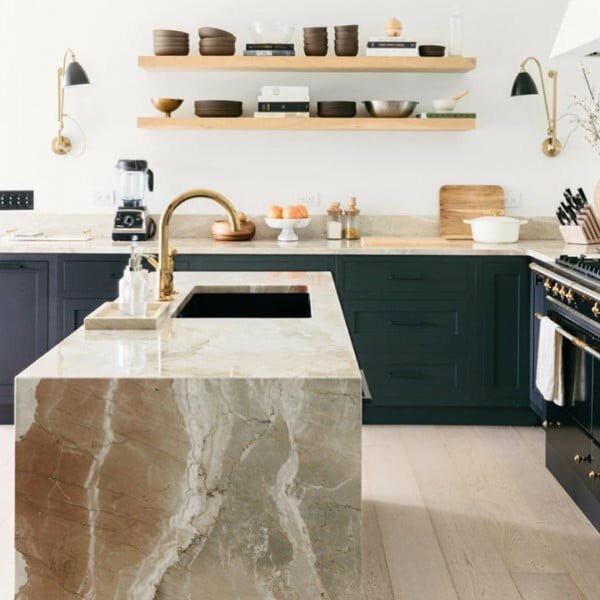 The quartz marble slab, metallic handles, and stone-wash wall interiors add the perfect backsplashes as well. 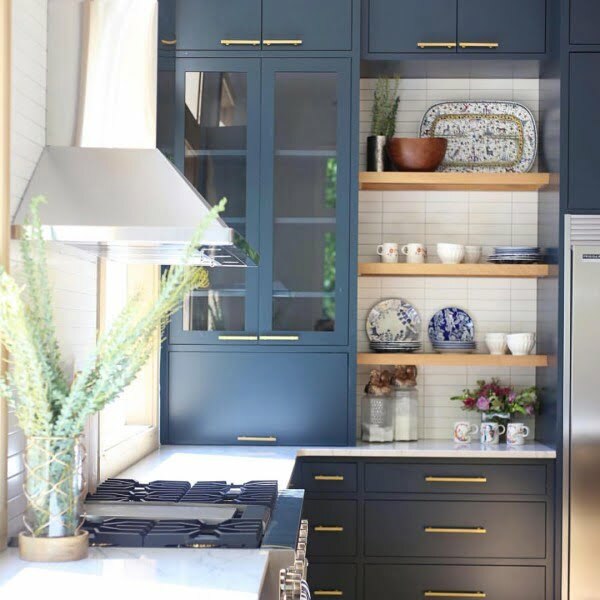 Add some blue cabinets to your open shelves for true opulence and sophistication. Check out the blue geometric designed cooktops as well — magnificent! 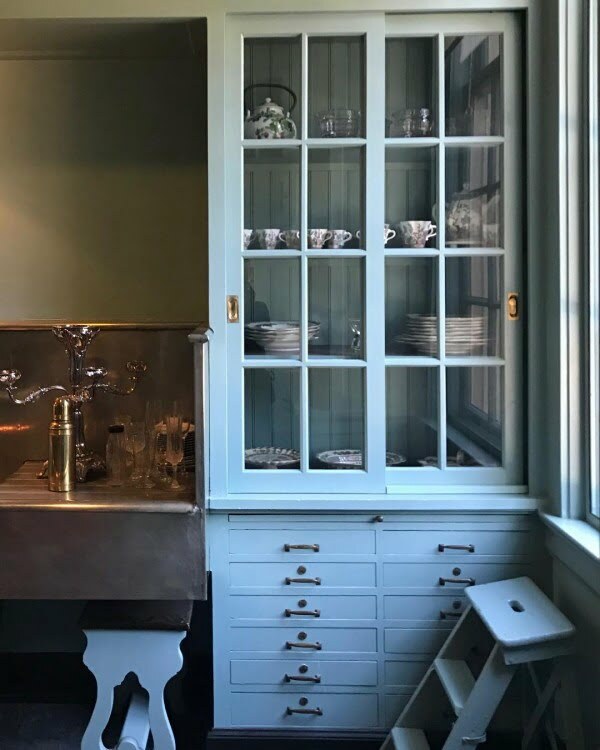 Navy Blue makes the list again with this stand-alone China cabinet. 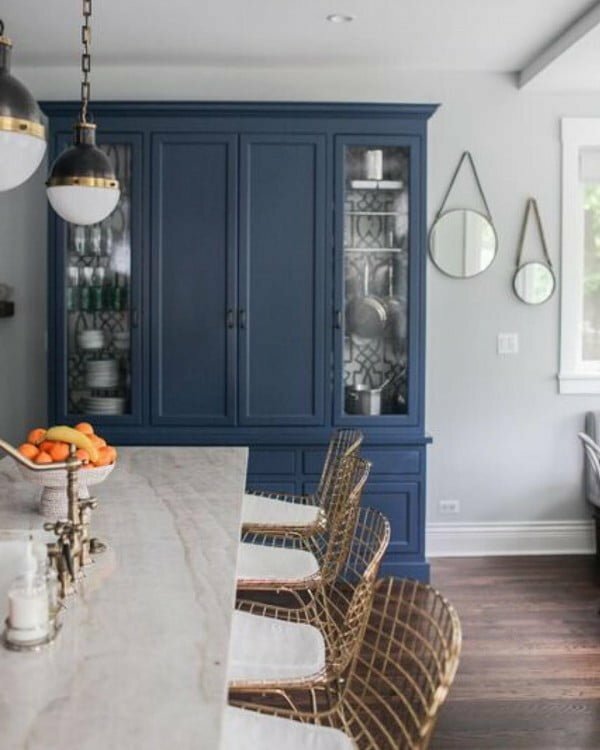 Whether separate or together, you can never go wrong with Navy Blue kitchen cabinetry. Spruce up any glass cabinets with blue trim or blue paint. This project uses a mix of both to make the appliances, walls and even flooring stand out!